Whether you need installation of a new heating and cooling system or if you have an existing system that needs maintenance or repair, Metzger’s Heating & Cooling is equipped with the experienced and knowledgeable staff needed to tackle the problem. Located in Kalamazoo, Michigan and servicing all surrounding areas, we service both residential and heating and cooling systems. If it’s related to HVAC, we can handle it. We are a Bryant Factory Authorized Dealer offering a full line of air conditioners, heat pumps, furnaces, boilers, thermostats, and commercial systems. Our installation comes with a 100% satisfaction guarantee—if you’re for any reason unhappy with the installation, we will come back for free to remove it. In addition to helping you find perfect heating system that is both the right size and most efficient for you, we offer a full line of services for maintenance and repair. When it comes to your heating system, you don’t want to mess around. Going without heat in the cold winters we have been having is simply not an option. To get your home comfortable again as soon as possible, we offer 24-hour emergency service at 269-385-3562, and we service furnaces of all makes and models. If you’re worried about unexpected furnace repair costs, we offer extended warranties on both our parts and labor. 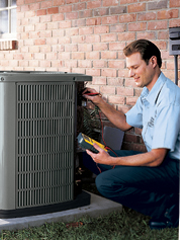 A central air conditioner can a world of a difference during those hot summer months. If you don’t already have a system in place, we are happy to recommend a product as well install it to help make your business or home an enjoyable place to be when the heat’s too much to bear. We have the know-how to diagnose, adjust, and troubleshoot any problems you may be having with your AC unit, whether or not you got it from us. We can service all makes and models of air conditioning units and get the system back up and running as soon as possible—even if it’s the middle of the night!